The PC market experienced a 14th consecutive quarter of decline, dating back to the second quarter of 2012. 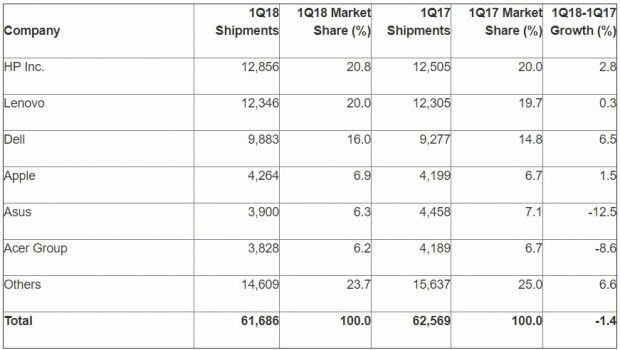 According to Gartner, worldwide PC shipments totalled 61.7 million units in the first quarter of 2018, a 1.4 per cent decline from the first quarter of 2012. While HP Inc.’s shipments increased 2.8 per cent in the first quarter of 2018 versus the same period last year – HP topped Gartner’s chart for worldwide PC unit shipments among vendors – and other regions outside Asia and the U.S. saw some overall growth, it wasn’t enough to drive overall growth for the PC industry. Worldwide PC vendor shipments. Data includes desk-based PCs, notebook PCs and ultramobile premiums (such as Microsoft Surface), but not Chromebooks or iPads. Stats are based on shipments selling into channels. Source: Gartner. HP, Lenovo and Dell accounted for nearly 57 per cent of global PC shipments in the first quarter of 2018. Dell’s shipments increased 6.5 per cent, which was the strongest growth rate among the top six vendors worldwide. In the U.S., Dell snatched the top spot for overall shipments, and while HP’s worldwide shipments went up 2.8 per cent, they declined by 4.8 per cent in the U.S.
Kitagawa also pointed to the rising average selling prices (ASP) of PCs. According to statista, the ASP of PCs worldwide between 2015 and 2019 is expected to hover around $800 CAD. While the Gartner report didn’t mention specific numbers, Kitagawa said the ASP increase can be attributed to component shortages and a rising bill of materials.